I have a deep powdery love for sledding that crystalized in the early dawn of my youth. 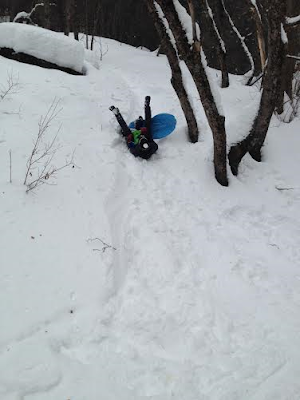 You could say I've had some serious pivotal sledding moments in my life. Click the link to read of one in particular. And whenever I go I feel that same important feeling. It's a feeling, you, this here, what i'm doing now, you reflect a big piece of me. The kind of feeling where the the identification of which makes one feel a little bit more whole. This weekend we threw on our winter garb yet again--can I tell you how wonderful it is to dress in winter clothes recreationally?? as opposed to "because i'm stepping outside my house for any reason"?? ?-- and made for the mountain pass. The weather in the valley was wet and drearisome but in the mountain realm all was white and fluffy and magical. I love that, for the most part, it stays untouched in the mountains. You have more time to enjoy it. It hangs on just a little bit longer, for you. 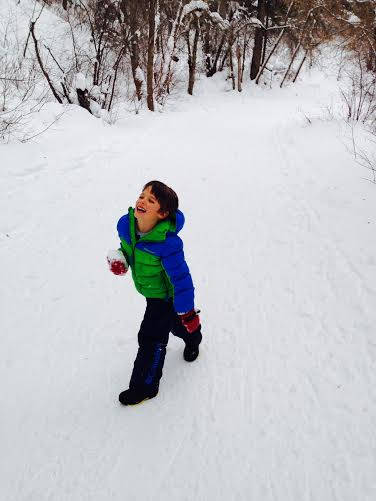 We had gone up a few days before and snowshoe'd on a cross country ski path. 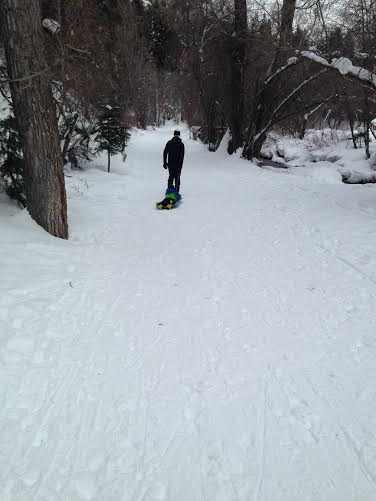 It was glorious because there were at least a baker's dozen feet of snow up in them hills. Julian has his own little shoes and used them for the first time. He loved it. We all did. We'd pull off to the side and play in the snow a bit, climb some rocks, cheerfully hang our lives in the balance as we edged to the river. Built tiny snowmen with all the snow you could ever need. We passed a lot of people, or they passed us, but it wasn't too crowded and everyone is just so happy to be out enjoying winter like it ought to be enjoyed. You can't see him; he is there. It was when we were doing something like this where we hit something and turfed it, knocking heads together, bodies sent sprawling into the white abyss. Julian was shocked and I explained it was a decent head bump, and an expected casualty of sledding. He seemed to accept this and wore it for a minute as a snowy badge of honor even though it really did hurt like a mother. We passed a snowman we'd made the time before, perched atop his rock, and made our way to a sled trail up the mountainside it looked like someone had attempted but was incomplete. I learned something valuable this trip, and it is that I love mountain sledding. 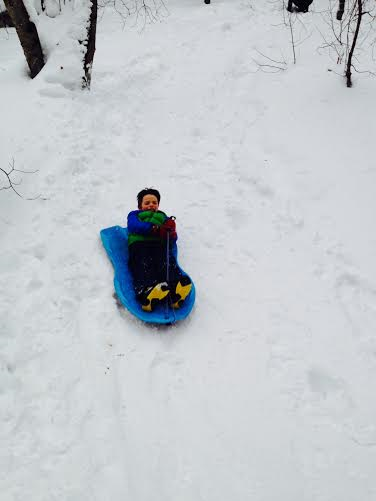 It is my favorite kind of sledding. Why? 1. There's just so much snow. It doesn't melt, at least not like it does around here. And a lot of it remains untouched. 2. The combination of speed + danger. It's like that sagebrush hill from the link. I love having an obstacle course and I love not exactly knowing what course my sled run will take from one time to the next. The unknown is exhilarating and each millisecond that goes by where you zoom past unfettered, is exciting and you feel a sense of accomplishment. I was not knocked over by a bush! I did not have to bail out prematurely! I made it this far! I made it to the end!! 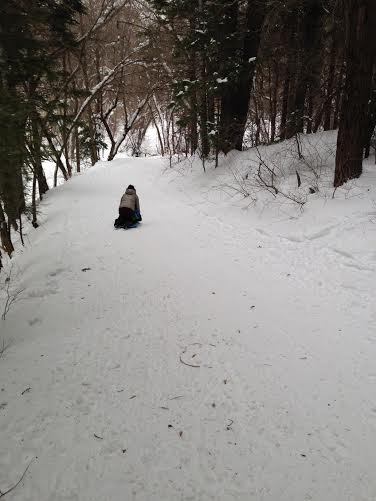 These are all the thoughts I have as I sled down the mountain. 3. Uncharted territory. The mountains are big and vast. Wild, untamed. 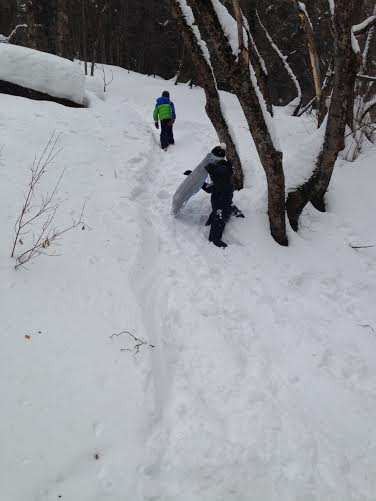 No civilized sled trails here. 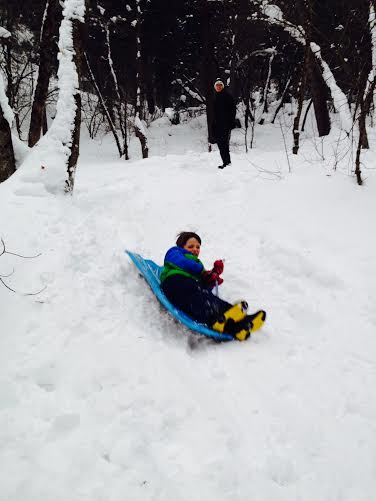 No one's sled (sledded? what the hey? Can sled be a verb?) here before. 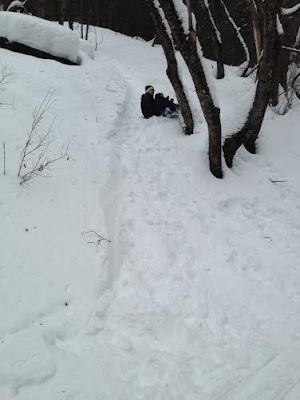 We are sledding trailblazers. Along the walk back we'd pick other spots we thought might be good not knowing at ALL what lay beneath us, whether it be tree, rock, empty space, deep ravine, or whatever, but being fairly certain we had a good several feet of snow to support our weight. But boy, it was deep. "You're going SO FAST. It's like the sled isn't touching the ground and you're not touching the sled. Just Jen in the air." It doesn't look steep but it was, it was steep! watch out, sean--headed straight for that tree. oh, nope--still aimed at the tree. ok, back up the mountain. dig out your leg first. Too fun. On the walk back we checked out another part of the mountain and tried it out. 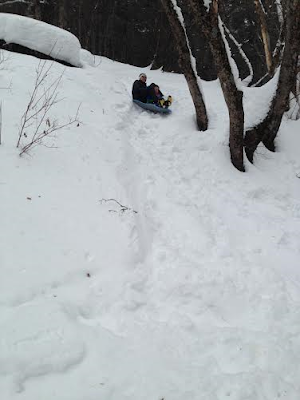 It was crazy steep and also fun but maybe too steep. Lots of treachery going on with that one so we quit before we broke something. 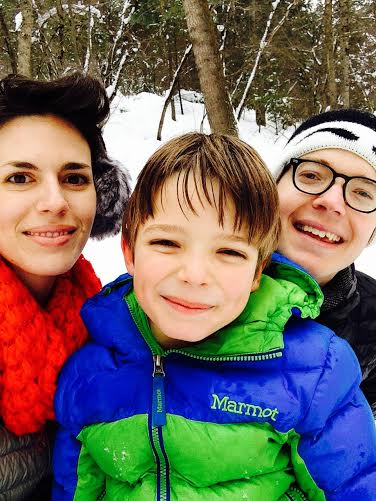 Snowy family pic. I generously let Sean borrow my severe eyebrows hat. He's probably better suited for it as my own eyebrows are already pretty severe.